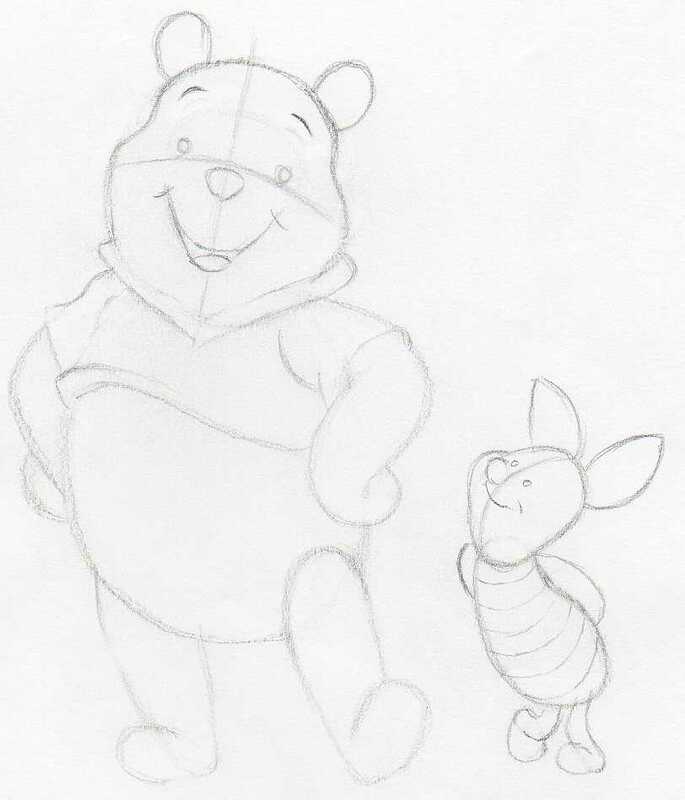 The best way to draw Winnie the Pooh is together with the Piglet. Pooh and Piglet are such an inseparable duo like Tom And Jerry. 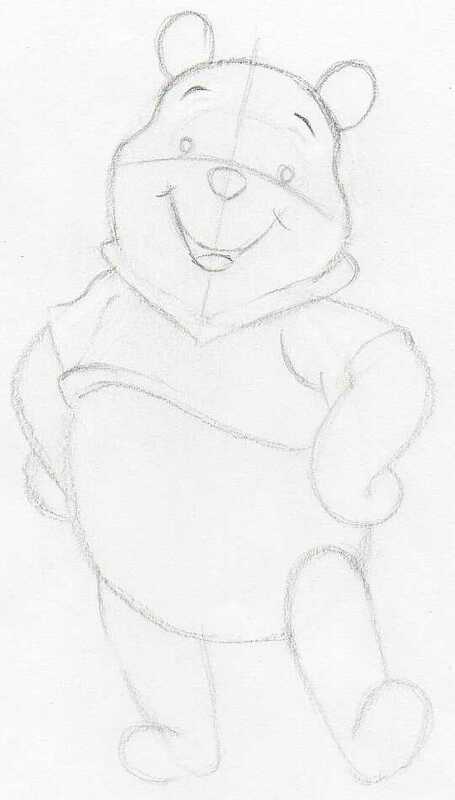 I would say that drawing Pooh Bear is one of the easiest among cartoon characters tutorials. Check out each step in the sequence and you'll see that it is really very easy and simple. Did you know that the first Pooh book was published in 1929? You may also like some of Pooh and Piglet quotes that are often very uplifting and very positive. 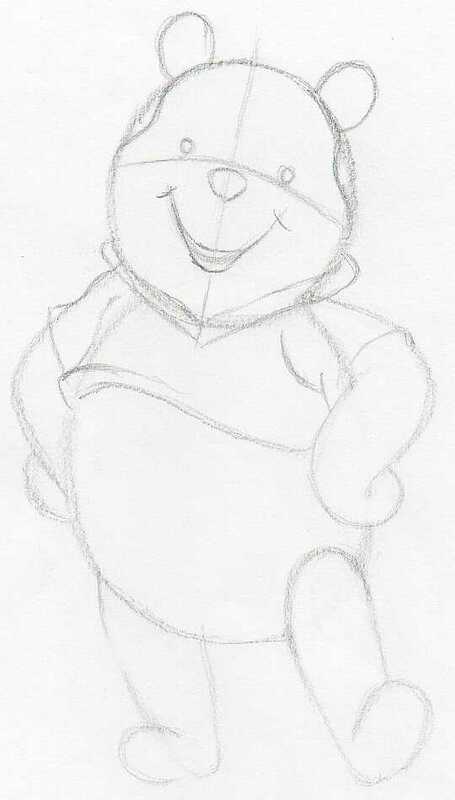 Before you begin to draw Winnie the Pooh, observe this finished picture well. Take a closer look at Pooh's body, how it is structured. 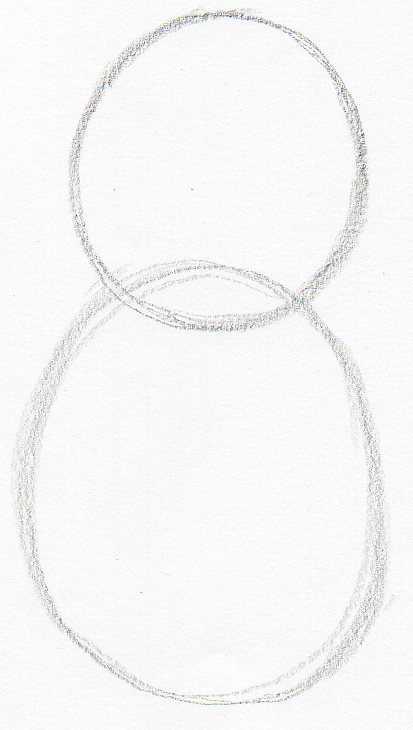 Sketch two uneven circular shapes as you see on this picture. The upper, circle-like is Pooh's head and the lower one, the egg shaped, is his belly. 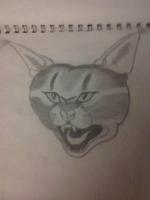 Sketch a center line across his face. This will be the guide line for drawing the face features. Outline the hands, legs and ears. Make sure you push the pencil very lightly because you are going to erase most of these lines later. 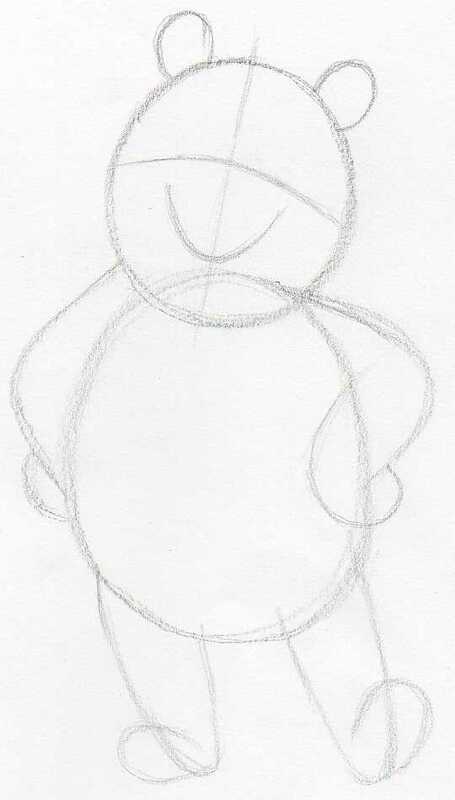 Sketch both Pooh's feet and hands.Draw another center face line, this time horizontally. This guide line will help you to pitch the position of Pooh's eyes and nose. Outline his smile. It is really very easy to draw Winnie the Pooh as you see. Every step in the sequence is very simple. Mark out Pooh's eyes and nose. Horizontally sketched face cross line is very helpful now. 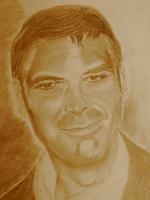 Outline the contours on the upper half of his head. You can begin gradually erasing some initial guide lines. Refine his smile. Sketch out the contours of Pooh's red shirt and collar around his neck. Keep erasing the unnecessary guidelines because they are obstructive as you proceed on outlining more details. A pen shaped eraser will come very handy if you have. For your future drawings, I recommend you to buy yourself one. It is really very useful. 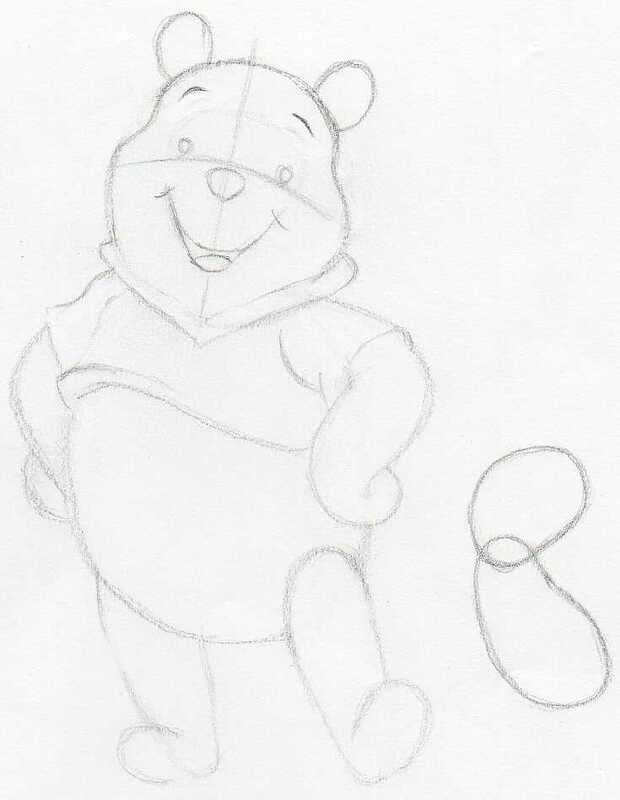 The rough sketch of Winnie the Pooh is now complete. You've now learned how to draw Winnie the Pooh. The next step will be the Piglet, Pooh's best friend. Outline Piglet's head and belly. Draw two uneven noodles, similar as you see here. 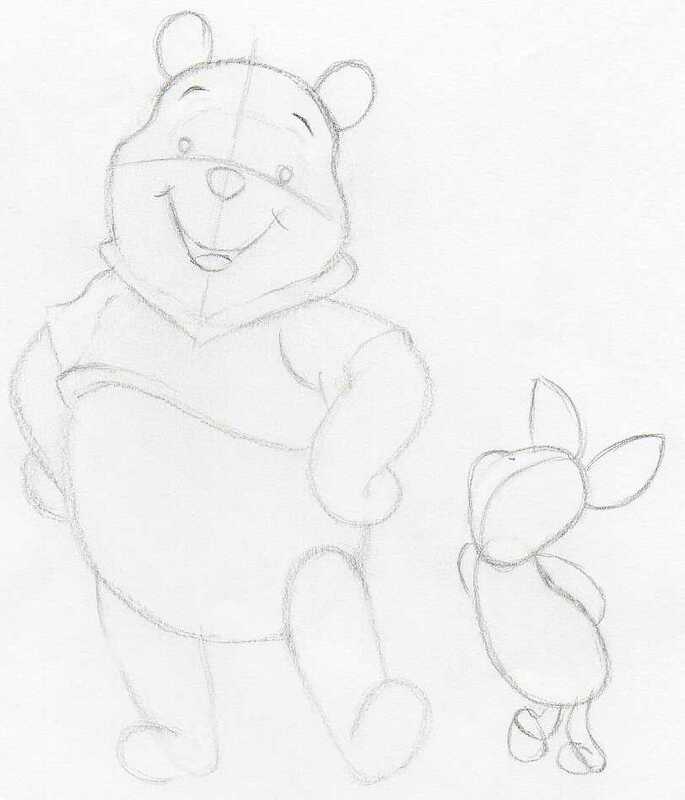 Since you are drawing the Pooh and the Piglet together, make sure that the body size proportions to each other are approximately the same as you see here. Winnie the Pooh is much bigger than the Piglet, so try to keep their body size in proper balance. Sketch Piglet's legs, hands and ears. Add the nose part, a small addition to the head circle. Sketch the center line on Piglet's face as you see on the picture. Outline the feet. Outline Piglet's face features and the striped pattern on Piglet's clothes. This drawing exercise is very good because here you can learn how to draw Pooh and at the same time you learn how to draw Piglet. 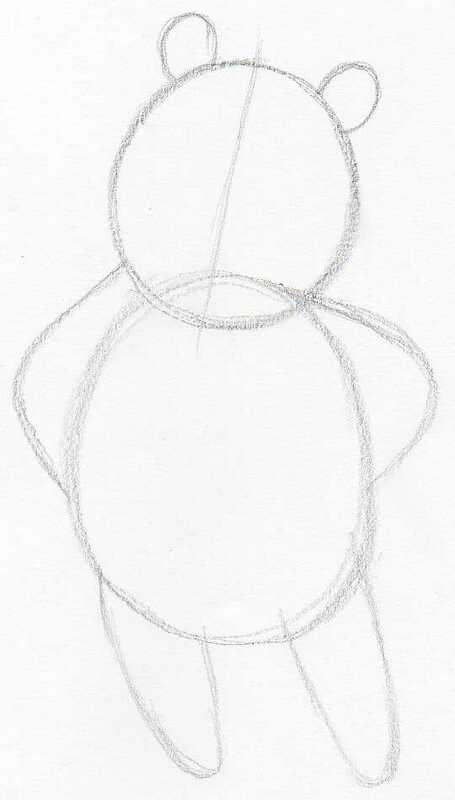 Take a light brown color pencil and draw a distinct clean contour line all around Pooh's body. 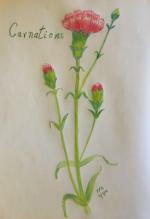 Do the same on Piglet using pink color pencil. 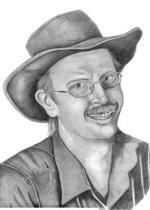 Now you can begin to erase the residual pencil sketch lines. 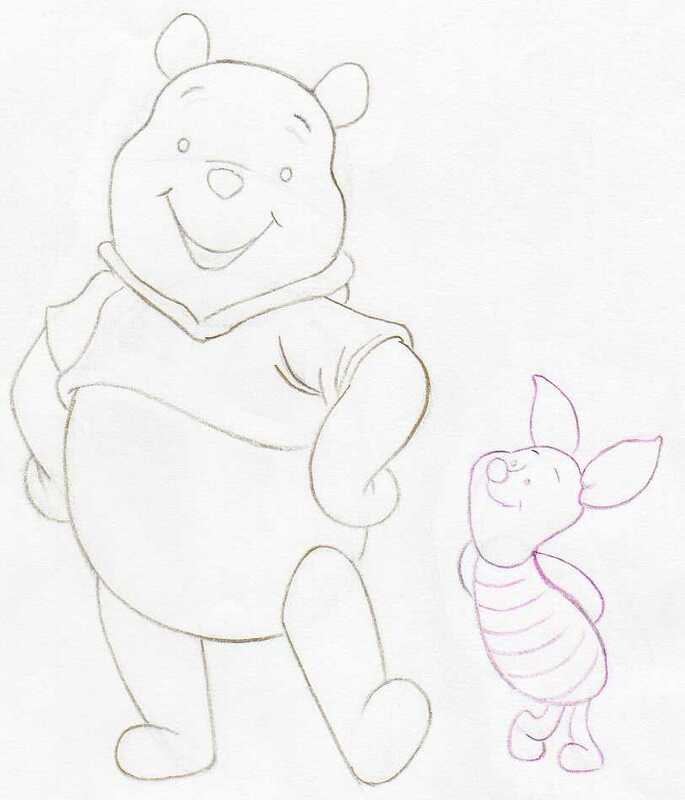 When ready, you will have a clean contour drawing coloring page template for both, Pooh and Piglet. 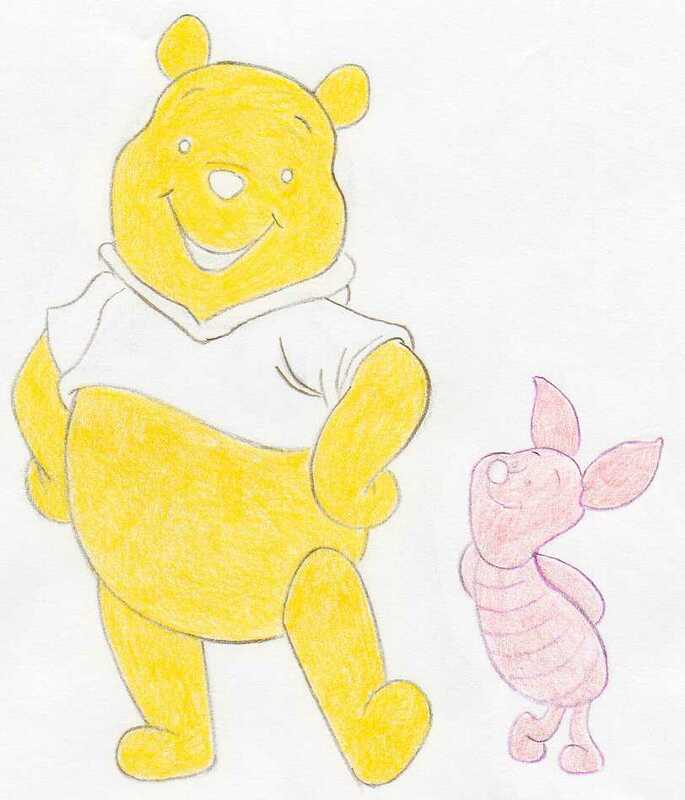 You've basically learned how to draw Winnie the Pooh and Piglet together. The rest is the best part: coloring. Color out Pooh's body using yellow color pencil. Just flat plain yellow color, same color tone, no shading yet. 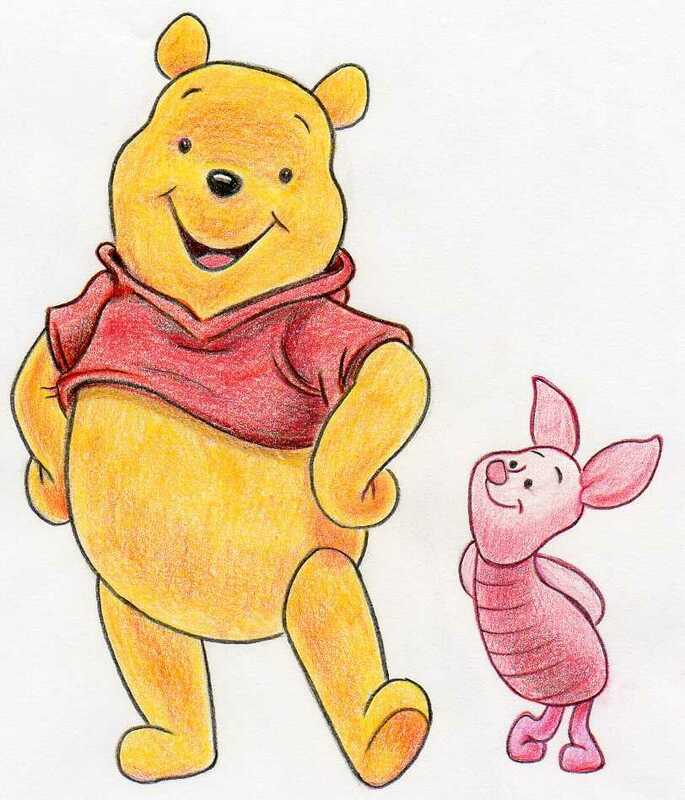 Similarly, color out Pooh's shirt using red color pencil. Do the same all over Piglet's body by a pink color pencil. Keep on adding more brownish colors on Pooh's body. Also notice that the shades are colored using red color. Make coloring test on a separate paper if you are unsure. Color and shade Piglet's body the same way. 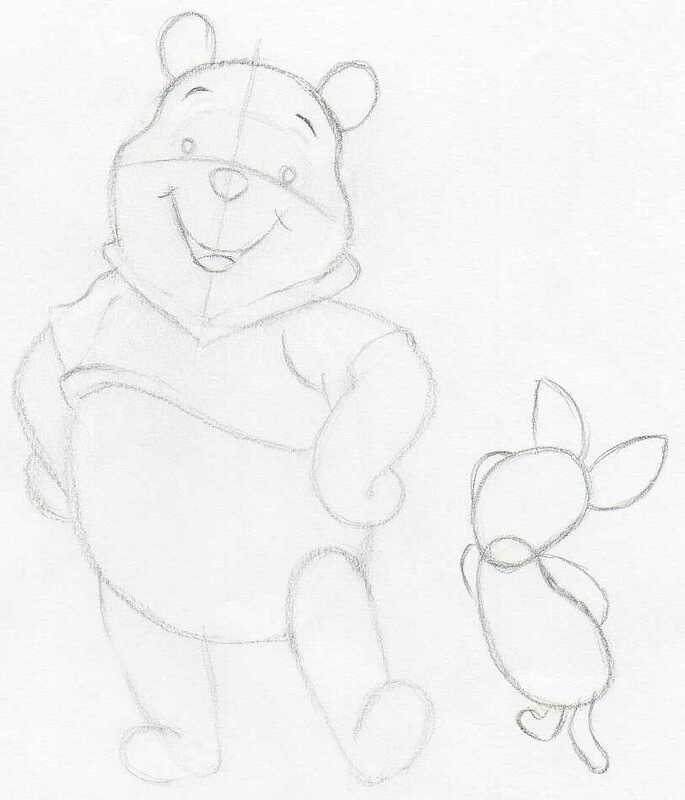 As a final touch, take a well sharpened black color pencil and draw a clean contour line over Pooh's and Piglet's body. 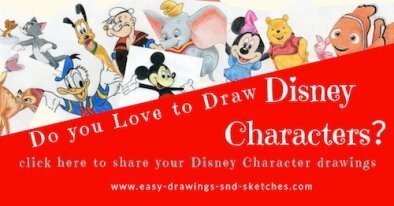 You've learned how to draw Winnie the Pooh and his best friend Piglet. Now, you have a finished colored drawing! 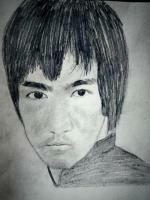 Click the banner below and upload your drawing, we all would love to see it.